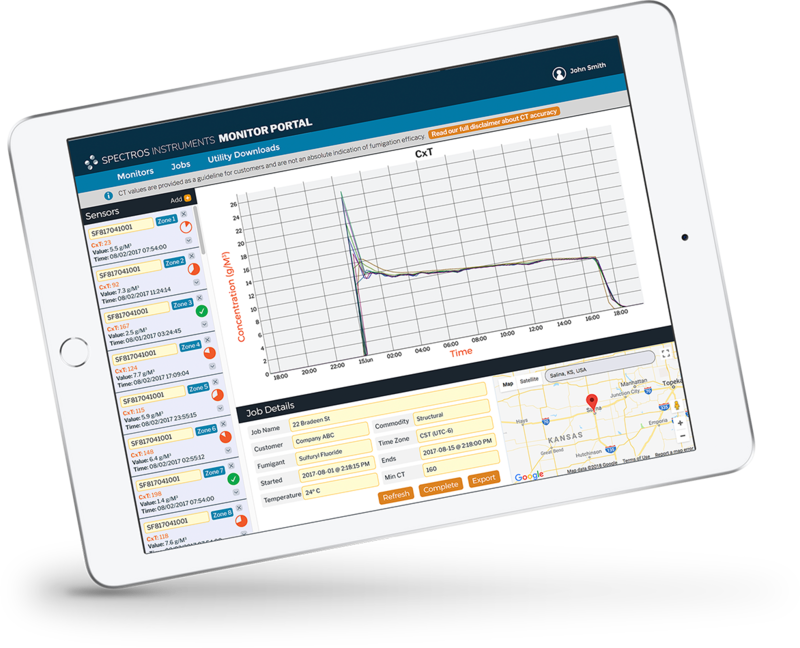 Structural and Commodity fumigations show the advantages of the Spectros Instruments Monitor Portal for real-time fumigation analysis and encrypted data transfer. Traceability to Compliance is achieved for certified fumigations. Performed on a 53,000 ft3 residential type structure with a slab foundation. The HLT (Half-Loss Time) was excellent proving confinement of gas. The fumigation was a success and target CT (Concentration x Time) goal was achieved. Monitor fumigations instead of paying overtime to employees. This fumigation was a large multi-unit office complex with varying grades and underseals. Graph demonstrates a very good HLT and the job was finished ahead of schedule. By utilizing the remote monitoring feature, the fumigator was able to avoid repeated trips to the site for manual readings. Customer received a report detailing proof of a successful result. This graph illustrates what happens when a tarpaulin is blown open and gas is lost A. At midnight local time the tarpaulins were ripped off the building by a strong fast moving thunderstorm. The fumigator was alerted to the loss of gas and able to see the loss on the graph but was unable to do anything about it until the next morning. The fumigator was able to see the accumulated CT before the “blow-out” B and therefore used additional exposure to surpass the target CT C. This would have been impossible to do without live monitoring. Multiple grain silos with monitoring positions high and low in each. Sleep Mode Feature A was utilized in which each zone is measured then readings hibernate for specific time. Facility lost power over weekend B with no loss of data and fumigation monitor re-started automatically C. The fumigator changed to continuous reading mode D with addition of top-off gas. Multiple grain silos with monitoring positions high and low in each. Sub-lethal dosages were recorded at two silos A. The automatic cylinderized phosphine dispenser lost power and concentrations dipped below lethality B. Make-up gas was added to get required lethal concentration C. Excessive phosphine gas concentrations were noted in basement of silo complex D.
Multiple Fumigation Chambers for QPS Treatment show excellent agreement of methyl bromide concentrations A. One chamber exhibits leak near injection point to chamber and corresponding lower concentration B.